Still catching up on old things I failed to post when they landed, this time a report on the Royal Canadian Mounted Police (RCMP) community engagement programme that I undertook and wrote with some RUSI colleagues (Charlie and Calum) as part of Canada’s Kanishka funding programme – thanks again to Kanishka for the support. The project was initially more focused on Lone Actor terrorism, using them as a vector through which to understand how community engagement and policing could be improved. The logic of this flows that given Lone Actors isolation and detachment from known terrorist networks, they do not necessarily set off the usual intelligence or police tripwires. Therefore it is important to try to develop and embed these tripwires within communities, hence the importance of community policing within this context. I have a larger project on Lone Actors in the more classic sense currently underway which should start producing material soon. In the meantime, any thoughts or comments welcome. The terrorist attacks of October 2014 in Ottawa and Saint-Jean-sur-Richelieu, Quebec, demonstrated that the historically relatively benign security environment within Canada has given way to a much more uncertain present. The nature of the terrorism threat to Canada has come to reflect broader terrorism trends experienced by other Western countries. While overall cases remain rare, the number of terrorist incidents involving lone actors in both Europe and North America appears to be increasing, attributed to a number of drivers and motivated by a diversity of violent ideologies. Canada’s approach to counter-terrorism warrants closer attention in light of this changing threat picture and the evolving threat of lone actors – not least because the risk of lone-actor terrorism puts Canadian citizens on the front line of any future response. Drawing on first-hand interviews with practitioners and policy-makers, as well as wider literature, this report looks specifically at the phenomenon of lone-actor terrorism in Canada alongside the community engagement programme of the Royal Canadian Mounted Police. It examines case studies in recent Canadian history to highlight the issues surrounding community engagement pre and post attack, and provides recommendations to improve the programme, offering insights to other countries facing similar threats. Further catching up on delinquent old posting, here is a piece I wrote for the EU’s foreign and security policy think tank EUISS. Part of a series they did on Central Asia, and bigger work they have been doing recently in support of the Latvian Presidency of the EU which has been focused on this topic. Big thanks to Eva for helping me connect with this project. It is in the first instance important to look at the geographical link that exists between China and Central Asia. This flows principally through Xinjiang, China’s westernmost province which is home to a disgruntled Uighur population, some of whom are currently locked in a painful struggle with the Chinese state. An ethnic minority in China (though almost 10 million strong, with a substantial diaspora in Uzbekistan, Kyrgyzstan, Kazakhstan and Turkey), the Uighurs are closer in terms of culture and language to Central Asian peoples like the Uzbeks. Stemming from Xinjiang (a region that covers a sixth of China’s landmass but contains roughly 1-2% of its population), Uighurs have long complained that their identity is slowly being eroded by Beijing-sponsored Han Chinese immigrants. This alienation has resulted in protests, as well as violence directed against the authorities, the resident Han population, and local Uighurs seen to be collaborating with the central government. The most recent bout of serious civil unrest can be traced back to 2009, when roughly 200 people were killed during riots in Urumqi, Xinjiang’s capital. In the wake of this event, Beijing’s attention was drawn towards the troubled region, and a subsequent work plan laid out in May 2010 signaled a new push towards fostering development in the province. This focus was not in fact completely new. Chinese officials had long worried about Xinjiang and the underdeveloped nature of China’s western frontiers. While coastal provinces like Shanghai and Guangzhou were booming, some regions in the centre and west were left behind economically. In addition, China’s foreign policy was almost exclusively focused on maritime disputes and the country’s relationship with the US. The reality is that if Xinjiang is to be developed, China needs a more prosperous region in its vicinity to trade with – and through. Far from the coast, Xinjiang’s southern markets are closer to Europe or the Indian subcontinent than they are to China’s mighty eastern seaports. The result is an approach towards Xinjiang that is focused on economic development and improving its links through Pakistan and the countries of Central Asia. The outcome of this approach is the development of the Silk Road Economic Belt, a corridor that (eventually) will connect Xinjiang to Europe. A project that is being implemented by Chinese companies with funding provided by the country’s policy banks, it seeks to help (re)connect Central Asia to China. The region is consequently being transformed from one which is wired to Moscow to one which is increasingly wired to Urumqi – and Beijing. Unlike the US plan to forge a ‘New Silk Road’, China has devoted substantial financial resources to its Silk Road Economic Belt – some $40 billion has been allocated for external aspects, and $17 billion for projects within China. Beyond this, new international financial institutions created and funded by China – such as the BRICS Bank or the Asian Infrastructure Investment Bank – all point to a Chinese desire to help and fund the development of its immediate neighbourhood. There are clearly selfish motivations for China’s investments – from Turkmenbashi to Khorgos, Chinese traders are often the most dynamic players on the ground. But while the overall project is designed to help improve China’s undeveloped regions, there are also clear ancillary benefits for Central Asia. China is, however, not solely an economic giant: it has demonstrated a growing willingness to engage in security matters in Kyrgyzstan and Tajikistan (perceived by Beijing to be the most unstable of the Central Asian states) through bilateral military support and training. Beijing might not want to take full responsibility for the region’s security, but with every visit by a Chinese leader resulting in greater economic connectivity between these countries and one of China’s most sensitive provinces, it is becoming increasingly difficult for its government to simply ignore its place as a regional stakeholder. That said, Beijing remains uncertain of how exactly to exert its power. And it is here that the EU might step in and play a role in influencing China’s posture. For example, Chinese officials and businessmen often fall into the same corruption traps as their European counterparts active in Central Asia. The European Bank for Reconstruction and Development (EBRD) and other European entities, however, effectively operate in the region, and their lessons learned are ones that Chinese enterprises could benefit from. China has likewise little experience in resolving border disputes, while European bodies like the OSCE or projects like the EU’s Border Management Programme for Central Asia (BOMCA) have an extensive history of being deployed in the region. If China’s wish to build a trade corridor through Central Asia is to become a reality, Beijing’s policymakers will have to establish ways to deal with the region’s complicated dynamics. Europe can help China with this aim, while also helping to promote greater regional stability. For example, joint training and capability building missions, cooperative security strategies, and efforts to counter drug trafficking and criminality in the region would advance both Chinese and European interests. At a more strategic level, there is an opportunity in the Silk Road Economic Belt for Europe to develop its relations with China. 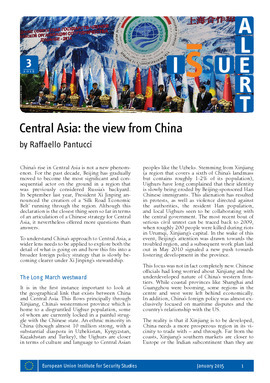 It is not only part of Beijing’s vision for Central Asia, but has formed the contours of China’s foreign policy towards a raft of regional partners: economic corridors similar to the Belt are now are sprouting from every direction to and from China (including the China-Pakistan Economic Corridor, the Bangladesh-China-India-Myanmar Corridor, and the Maritime Silk Road). This increases the importance of the Silk Road Economic Belt and offers a chance for Europe to play a role in a project that is both key for the Chinese leadership personally and important to a strategically significant region which Europe has expressed a keen interest in. The Belt already effectively exists. It has (under different auspices) been a reality for almost a decade or more. China’s leadership has decided this is a cornerstone project which ultimately should stretch all the way to Europe. If Europe were to reach back and thereby improve its relationship with China, there would be significant benefits for all actors involved. Raffaello Pantucci is the Director of International Security Studies at RUSI. A very belated posting of an article that came out a while ago for the CTC Sentinel. It has been a very hectic and busy time and I have let things slip, but am going to try to finally catch up. A few longer pieces are working their way through the system and should land soon, and far more exciting my book on Jihad in the UK is finally done and printed. So look to a lot more in that direction soon. To catch up on a few conversations I had with the media, I spoke to ITN about a recent case which is featured in this article, Brutschom Ziamani, to the Washington Post about terrorists getting guns in Europe, to Channel 4 about ISIS, Aftenposten about UK terrorism, spoke to Foreign Policy about terrorism in Xinjiang, to McClatchy about Uighurs going to join ISIS, and a longer interview for NPR in the US about responses and the threat in the wake of the Charlie Hebdo attack. So far, there have been five publicly identifiable, alleged plots disrupted in the United Kingdom as well as a number of scares. The alleged plotting dates back to October 14, 2013, when British police in London conducted a series of dramatic arrests to foil what was at the time characterized as a “suspected Islamist terror plot to attack London.” Almost exactly a year later, the trial against the two defendants charged in the wake of the arrests (two other individuals were released without charge) took place, providing Britain with the most detailed look yet into the nature of the threat that Britain’s security services see emanating from Syria. Ultimately, one of the men pleaded guilty while the jury could not reach a verdict in the other case. Amplifying the perception of the threat to the United Kingdom, as the trial was underway, police arrested another group of individuals who stand accused of plotting terrorism, and the United Kingdom experienced its first reported suicide bomber in Iraq. This article will examine the current landscape of Islamist terror activity linked to Syria and Iraq in the United Kingdom, examining both recent plotting on the domestic front and the growing role of Britons in Syria and Iraq. It concludes that the lines and links between these two categories of radicalized Britons present a fluid and complicated community that is continuing to produce a steady stream of plots and networks of concern to security services. Both are building on significant challenges that have been extant in the United Kingdom for some time and that were most recently highlighted in a parliamentary report into the May 2013 murder of Lee Rigby by Islamist extremists. That plot, and the parliamentary investigation, showed the complexity of the lone-actor terrorist threat the United Kingdom faces from both isolated individuals and those already on the radar screen of intelligence services, something that is increasingly also seen among the pool of potential threats emerging from radicalization of Britons in the wake of the rise of the Islamic State in Iraq and the Levant (ISIL). The threat from Syria and Iraq is increasingly maturing and following a trajectory that reflects broader trends that have been visible in the United Kingdom for some time. Syria and Iraq and the associated foreign fighter flow is something that British security services expect will occupy their attention for the immediate future. The trial of Mounir Rarmoul-Bouhadjar, a 26-year-old British national of Algerian descent, and Erol Incedal, a 26-year-old of Turkish origin, opened October 8, 2014, at the Old Bailey. Initially, the trial was to be held in secret with the two defendants listed anonymously as AB and CD, but after a media-led battle in the courts, it was decided that only some of the trial would be held in secret and that the two defendants would be named. On the eve of the trial, Rarmoul-Bouhadjar pleaded guilty to possessing a “document containing information of a kind likely to be useful to a person committing or preparing an act of terrorism, namely a document entitled ‘Bomb making.’” A second charge of improperly obtaining an identity document was dropped. Incedal, on the other hand, fought the case, and after a month long trial a jury was unable to reach a verdict. The judge dismissed the jury and the Crown Prosecution Services (CPS) declared it would seek a retrial. Incedal was born to a Kurdish family in Turkey, where his father, an active communist, died when he was six weeks old. His mother, an Alawite, moved to Britain when Incedal was a year old, leaving her children to join her later in the UK. His older sister joined the Kurdistan Workers’ Party and died fighting alongside the group, while his older brother was later sectioned (taken into a secure mental hospital) under the mental health act. As a young man in the United Kingdom, Incedal was involved in gangs and arrested for attempted theft in October 2001. A year or so later he became religious, and soon afterward was drawn to Tablighi Jamaat, enjoying the brotherhood it provided. He traveled with the group to Greece, India, Bangladesh, and New York, and met his co-defendant Rarmoul-Bouhadjar in Tablighi Jamaat. Sometime in 2011 he became connected to the now-jailed sons of cleric Abu Hamza, Hamza, Sufyan, and Yaasir, with whom he was allegedly planning frauds and armed robberies of post offices. It is not clear what became of these plans. The prosecution’s case centered on the accusation that the defendants were planning a Mumbai-style attackor possibly a targeted assassination of former Prime Minister Tony Blair. In Skype conversations in which he used the name Fatima Hamoodi to communicate with an individual abroad who called himself Zaynab Alawi, Incedal wrote, “These straps are not the little ones, they are like the ones we have here – y knw k 1122aa shhh etc.” “Straps” was believed to refer to guns (a traditional terminology amongst urban youth in London) and “k 1122aa shhh” to Kalashnikov. Later in the Skype conversation the two Skype accounts were recorded discussing, “If they’re able to get these type and it works, may want you to MO 88M 55BAY style,” something the prosecution interpreted as being a reference to the Mumbai attacks of 2008. However, at the time of their arrests the men were not found in possession of any guns, though they were overheard through a police listening device discussing purchasing one in their car, using the slang “sausage” to refer to a gun and “sauce” for bullets. The plotting around the assassination of Tony Blair was far more circumstantial. Incedal was pulled over under the guise of a traffic stop in September, during which time authorities searched his car. In the process they found a Versace glasses case, which contained one of Tony Blair’s addresses. This same case was then later found at a second flat that Incedal failed to report to authorities when he was arrested. They also found evidence of multiple inhabitants and the computer on which Incedal was talking to someone abroad. It is unclear why the jury returned an inconclusive verdict, though likely the absence of weaponry or a clearly defined plan of attack left some major gaps in the prosecution’s case. It is likely that Incedal’s defense will eventually be revealed, though at this point it is being kept behind the veil of secrecy. The re-trial is expected to occur sometime this year. This is the not the only plot that British security services believe they have intercepted. In early October 2014, police arrested five individuals believed to be involved in a plot targeting police officers with a Russian-made Baikal machine gun and ammunition. Tarik Hassane, 21, a medical student at university in Sudan; Suhaib Majeed, 20, a physics student at King’s College London; Momen Motasim, 21; and Nyall Hamlett, 24, all stand accused of planning to use the gun and a moped to conduct a drive-by shooting of security officers. A fifth man charged alongside them was accused of supplying the gun. The men were believed to be inspired by ISIL and had allegedly downloaded ISIL spokesperson Abu Muhammad al-Adnani’s fatwa calling on followers to launch attacks, taken pictures of police officers, discussed ISIL online, undertaken online reconnaissance of a police station in west London, and pledged allegiance to the group. Charged with planning a terrorist attack, the men face trial this year. More recently, on the eve of the 2014 November 11th Remembrance Day celebrations in the United Kingdom, police arrested a further four men in raids that were believed to be linked to a plot to target security officials at a public event. The main suspect in the case, Yousaf Syed, is a 19-year-old who had his passport canceled after security services believed he tried to travel to Pakistan in 2013 for “terrorist purposes” and then in 2014 attempted to go to Syria. On November 20, 2014, three men (Yousaf Syed, Yousaf’s cousin Nadir Ali Sayed, and Haseeb Hamayoon) were charged with plotting to behead a member of the public on the streets of Britain. The men were reported to have “laughed hysterically” as the charges against them were read out in court and were reported in court to have been inspired by ISIL. They also face trial this year. A Congolese-British convert, Ziamani was also arrested in August in the wake of the release of the ISIL video in which the American reporter James Foley was beheaded. Accused of planning an attack similar to the one against British soldier Lee Rigby in Woolwich in May 2013, Ziamani was arrested with a knife and a hammer wrapped in an Islamic flag in a bag on his back. In presenting Ziamani to the court, the prosecution stated that “he is 19 and of previous good character. He said to (a female teenager) he is going to commit a … terrorist atrocity either on troops or members of the government.” He was further accused of wanting to go to Syria to fight alongside ISIL. Both men are due to stand trial this year. The lone-actor plot, in particular targeting authorities, has become the heart of the threat that British security services currently see. In early December 2014, a threat believed to have come through social media ignited concern that police officers in Birmingham were to be targeted for attack. One man was arrested as a result. This concern escalated further around Christmas with armed police standing guard outside prominent locations in London where formal sentries stand to attention in dress uniform (such as Buckingham Palace or the famous Horseguards Parade), while service personnel were told not to wear their uniforms to and from work. This escalating number of plots took place against a backdrop of revelations that British fighters were killed in U.S. airstrikes against Khorasan Group camps near Aleppo on September 23, 2014; that a number of Britons died fighting alongside ISIL in Kobane, Syria; and that a Briton was involved in a suicide bombing attack alongside the group in Iraq. The suicide bomber was Derby-born Kabir Ahmed, who was revealed to have been previously convicted of hate crimes, and had gone to Syria in 2012. Ahmed is the second British suicide bomber to have been publicly revealed as dying in Iraq or Syria, though it is believed more than 30 Britons have died in total during the conflict so far. Furthermore, British-linked fighters are believed to be rising in the ranks of groups fighting in Syria and Iraq, most prominently in the case of the infamous “Jihadi John,” who is accused of being the executioner in the ISIL beheading videos and separately as the leader of a group called Kateeba al Kawthar. In proscribing the latter group, British Minister James Brokenshire described its leader as an individual with a British accent who is featured in recruitment videos under the name Abu Musab but whose true name was revealed as Rabah Tahari. Tahari’s wife and son were arrested and charged in Birmingham, accused of sending goods to him in Syria. Ultimately, charges against both of them were dropped, and Tahari is believed to continue to be out of the United Kingdom. All of this presents a worrying picture for security services who are concerned about the fact that British nationals are being radicalized, are fighting alongside numerous different groups, and are taking leadership roles in some cases. It is not clear whether the plots discussed in this article were directed by foreign groups or networks like ISIL, al-Nusra Front, or the cluster identified as the Khorasan Group on the battlefield in Syria or Iraq. In Incedal’s case, it seems that he was discussing his plans with someone abroad, but in the other cases no evidence of direction from overseas has yet been provided, though clearly the head of MI5 has identified that his service has seen such active plotting. Instead, the publicly identified and detailed plots appear to bear the hallmarks of being inspired by ISIL or potentially loosely linked to individuals with direct experience on the battlefield. Having already experienced the Woolwich incident, in which a pair of radicalized individuals who were longstanding subjects of counterterrorism investigations abruptly decided to run over in a car and brutally butcher an off-duty soldier, British forces are already alert to the possible threat from such small-cell or lone-actor terrorist activity. But given the potential numbers of individuals of concern connected with Syria and Iraq (of whom about 250-300 are believed to have returned home), the threat picture is one that has multiplied significantly. Distinguishing the fighters who are genuine in their desire to return home to ordinary lives from those who might pose a terrorist threat is a major challenge. However, given the current trend of plots that appear to have loose connections to the battlefield but limited direction, British security forces seem to be dealing with two distinct groups. One group within the United Kingdom seems to be radicalizing and, inspired by narratives that ISIL is broadcasting, is choosing to plot terrorist attacks at home. The other is choosing to go abroad to fight with some possibly returning home to plan attacks. The line between these two groups is unclear, but what does seem clear is that these two parallel trends, and their increasing collision together, will cause major counterterrorism challenges for the next several years at least. Raffaello Pantucci is Director of International Security Studies at the Royal United Services Institute (RUSI). 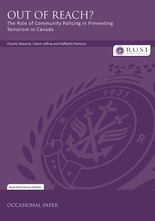 Andrew Parker, “Terrorism, Technology and Accountability,” Address by the Director-General of the Security Service, Andrew Parker, to the Royal United Services Institute (RUSI), Thames House, January 9, 2015. Justin Davenport, “Police foil ‘major Islamist terror plot’ after armed raids across London,” The Evening Standard, October 15, 2013. Patrick Sawer, Nicola Harley, and Tom Whitehead, “Armed police arrest four men amid fears of Islamist Remembrance Day terror plot,” The Telegraph, November 7, 2014. Martin Naylor, “Suicide Bomber: report claims Islamic State suicide bomber in Kabir Ahmed, of Normanton, Derby,” Derby Telegraph, November 10, 2014. “Report on the intelligence relating the murder of Fusilier Lee Rigby,” Intelligence and Security Committee of Parliament, November 25, 2014. Guardian News and Media Ltd vs AB CD, Royal Courts of Justice, Strand, Case No: 2014/02393C1, judgment handed down June 12, 2014. “Defendant in UK’s first secret trial pleads guilty,” The Telegraph, October 9, 2014. Duncan Gardham, “Terror suspect had ‘reasonable excuse’ for having bomb-making plans,’” The Times, October 27, 2014. Sean O’Neill, “Armed police hunted Mercedes of terror suspect and blew out tires,” The Times, October 15, 2014. In Kurdish, Partiya Karkerên Kurdistanê (PKK). Tablighi Jamaat is a Muslim movement whose name literally translates as “society for spreading faith” and is an off-shoot of the Deobandi movement in South Asia. Duncan Gardham, “Terror suspect had ‘reasonable excuse’ for having bomb-making plans,” The Times, October 27, 2014. Tom Whitehead, “Secret terror trial hears Erol Incedal considered joining forces with Abu Hamza’s sons,” The Telegraph, November 3, 2014. This refers to the 2008 terrorist attack in Mumbai, India, during which teams of Lashkar-i-Tayyiba attackers assaulted multiple targets in Mumbai using small arms and taking hostages, ultimately killing 164 people (including 10 attackers). Sean O’Neill, “Tony Blair was a ‘terror target,’” The Times, October 14, 2014. Tom Whitehead, “Erol Incedal secret terror trial: jury discharged and retrial ordered,” The Telegraph, November 11, 2014. Victoria Ward, “Secret terror trial hears Erol Incedal used code word ‘sausage’ to buy a gun,” The Telegraph, October 16, 2014. Victoria Ward, “Tony and Cherie Blair named in secret terror trial as potential targets,” The Telegraph, October 14, 2014. Sean O’Neill and Duncan Gardham, “Terror suspect ‘discussed Syria and buying firearm,’” The Times, October 17, 2014. “Terror accused ‘praised jihadist battles in Syria and Iraq,’” BBC News, October 15, 2014. Fiona Hamilton and Sean O’Neill, “Terror suspects charged with moped plot to shoot police,” The Times, October 18, 2014. Victoria Ward and Nicola Harley, “ISIL terror suspect Tarik Hassane offered place at top UK university,” The Telegraph, October 8, 2014. Michael Powell and Duncan Gardham, “Teenage suspect in ‘Poppy terror plot’ tried to travel to Syria six months ago to ‘take part in extremist activity,’” The Mail on Sunday, November 8, 2014. Martin Evans, “Terror suspects plotted to behead member of the public, court hears,” The Telegraph, November 20, 2014. “Islam: Teenager Gave ‘Kill Solider’ Order,” Court News UK, December 4, 2014. Martin Robinson, “British-born Muslim convert ‘plotted atrocity and had a knife and hammer wrapped in an Islamic flag,’” Daily Mail, August 21, 2014. Vikram Dodd, “Man arrested in West Midlands after police warning of security threat,” The Guardian, December 9, 2014. Abul Taher and Mark Nichol, “Retreating of the Queen’s Guard: End of an era as palace sentries fall back in face of mounting fears of new ‘lone wolf’ terrorist attack,” The Mail on Sunday, December 27, 2014. Secunder Kermani, “Friend of British jihadist Ibrahim Kamara tells of fight,” BBC Newsnight, September 25, 2014. Patrick Sawer and Duncan Gardham, “Portsmouth private school jihadi killed in Syria,” The Telegraph, October 25, 2014. Martin Naylor, “Derby would-be suicide bomber: He is dad Kabir Ahmed with gay-hatred convictions,” Derby Telegraph, July 24, 2014. Tom Whitehead, John Bingham, and Sarah Knapton, “Up to 30 British jihadists now dead in Syria but toll will rise with ISIS lure,” The Telegraph, October 15, 2014. Hansard Parliamentary record, June 19, 2014. “Tahari: Mum and Son Bailed Over Syria Terrorism Charges,” Court News UK, March 17, 2014. Tom Coghlan, “Let us come home, say young British jihadists,” The Times, September 5, 2014. Tim Shipman, Richard Kerbaj, Dipesh Gadher, and Tom Harper, “Terror alert over 150 UK jihadists,” The Sunday Times, January 11, 2015. Helen Davidson, “ISIS instructs followers to kill Australians and other ‘disbelievers,’” The Guardian, September 23, 2014.